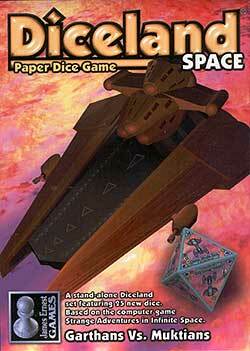 Diceland is a completely new kind of tabletop game, featuring unique combat mechanics and colorful paper dice. Each player takes one army of five dice (there are five armies in the set). Players take turns throwing dice into play and manipulating their dice in play. When you shoot an enemy die, it's worth a certain number of points. The first player to score 50 points wins the game. Diceland has elements of skill, luck, and strategy. You must be able to throw your dice skillfully, because where they land and what they hit will affect your position on the table. You must be lucky, because there's no controlling the orientation of the die when it lands. And you'll need some strategy, because once your die is in play you can maneuver and fire it like you would a traditional miniatures game. Diceland Space - Garthans vs. Muktians includes an 11-die Garthan army, featuring both the Light and Super Carriers as well as a vast array of small Fighters; the 8-die Muktian army featuring a mix of unusual ship designs; and the 5-die Tan Ru army, featuring a powerhouse 15-point Decimator and a wing of three mindless Drones. Also in the Garthans vs. Muktians box, you’ll find the 50-point Yellow Kawangi die, a bizarre and powerful die that’s sure to be illegal in tournaments any day now. Deep White Sea was the original Diceland set, and this set can be used stand alone or in conjunction (though it may seem strange putting Spaceships up against Elves). Extra abilities added to this Space set include Cloak, Remove and Dodge.